and I didn’t speak out because I didn’t want to breathe lead. and I didn’t speak out because I didn’t want to breathe exhaust fumes. and I didn’t speak out because I didn’t want to breathe particulates. but to live a sad, miserable, poor, unhealthy, freedom-deprived “green” life. In Italy (presumably, elsewhere too) unleaded gasoline comes from green nozzles. The color was chosen at the time to indicate it was an environmentally friendly kind of gasoline. Try explaining that to a contemporary greenie?? Polar Bears: Has the Daily Mail Just Pulled a Deceiving Article? In my “Maurizio Morabito” blog in Italian, I have been following for the last few days the developing story of drowning polar bears, lost at sea after “the ice float they lived on melted”. The story (“The heartbreaking picture of the polar bears with 400 miles to swim to the nearest ice “) (UPDATED LINK) originated in the pages of the Daily Mail, likely on Saturday Aug 30, and was immediately distributed in Italy by daily La Repubblica. Actually, the story is based on something that has happened, and was reported by the WWF on Aug 22: nine polar bears have been spotted (by chance) swimming near Alaska. One of them was at least 60 miles from land. But the Daily Mail article, by a Barry Wigmore, “embellished” the original story with so many incorrect details, the end result was abysmally not-true and deceiving. A couple of days ago the WWF published some clarifying statements. From those it would be easy to spot where Wigmore’s article basically made things up. But as I said, the Daily Mail website has “lost” the page. So which bits were patently baseless? Last night I did send a comment to the Daily Mail urging the article’s author to check his facts. Anyway: now that the story is not there any longer, conscious that it will linger on for years on many websites, thinking about how many people are needlessly worried by this story sexied-up to the point of not being true any longer, one can only reflect sadly at the sorry status of English and Italian journalism, trying to pass a fiction piece as a real story and/or gobbling it up without bothering to check the original sources. Finally, since I criticized them in the past, I want to add that I appreciate the fact that the BBC News web site has not fallen for Wigmore’s drowning polar bear fantasy. Timely broadcast on BBC Radio 4’s “In Our Time” series, about Lysenko and “lysenkoism”, the propaganda-based “science” that Stalin’s agricultural adviser managed to sell as “truth” from 1928 to 1962 at least. In 1928, as America heads towards the Wall Street Crash, Joseph Stalin reveals his master plan – nature is to be conquered by science, Russia to be made brutally, glitteringly modern and the world transformed by communist endeavour. Into the heart of this vision stepped Trofim Lysenko, a self-taught geneticist who promised to turn Russian wasteland into a grain-laden Garden of Eden. Today, Lysenko is a byword for fraud but in Stalin’s Russia his ideas became law. They reveal a world of science distorted by ideology, where ideas were literally a matter of life and death. To disagree with Lysenko risked the gulag and yet he damaged, perhaps irreparably, the Soviet Union’s capacity to fight and win the Cold War. The MP3 of the programme can be downloaded here. (a) Results, and success are declared before an experiment has completed (at position 12m10s, in the mp3 file above). In AGW, just look at the innumerable papers that take AGW as established truth, even as the debate on “attribution” is still very much open among mainstream scientists. (b) Proponents always declare “victory”, no matter what happens, and are always ready to shift the ground (mp3 position: 14m15s). That’s quite common in AGW circles: nowadays, if the planet warms up or cools down, it’s anyway compatible with AGW theory. (c) Science is presented as a series of “solutions”, not simply as “knowledge” (mp3 position: 19m45s). AGWers cannot disentangle research from advocacy: for example, the IPCC is politically active, to the point of qualifying for a Nobel Peace Prize. (d) According to the scientists, central planning is better than free capitalism (mp3 position: 35m45s). From Al Gore to London School of Economics’ Professor Lord Giddens, there is only one thought: free markets are not good enough, and a big State intervention is needed to save the planet from climate doom. Ironically, the BBC guests laughed only up to a point to the witty remark made by one of them: that Lysenko’s personality and attitude would have made him a “guaranteed success in British science today” (mp3: 24m15s). Even more ironic is the fact that Lysenko himself did come up with a geoengineering way to change the climate of Siberia (by planting trees in clusters, so that the weakest ones would sacrifice themselves to let the most resistant plants survive). A group of British scientists has proposed to rename the current geological era as the “Anthropocene“, to register the fact that human activities are transforming the world. The proponents, and many pessim-environmentalists all too happy to jump on the Anthropocene bandwagon imply no doubt that the aforementioned human activities are negatively transforming the world. But that is by no means a given. If humans are transforming the world it may be the absolutely obvious, and thus ethically neutral if not positive, consequence of the fact that we have evolved brains: and it would look silly to feel cold in winter and hot in summer. Cue the discovery of fire, and the invention of air conditioning. Analogously regarding teeth: who would want to have them pulled without anaesthetic? Cue the history of medicine and dentistry, including metallurgy. And so on and so forth. Or alternatively: could the Anthropocene be just one of the signs that the Technological Singularity is really going to happen, thereby possibly transporting humanity to a completely new way of living? The Earth Policy Institute has published an excerpt from the first chapter of Lester R Brown’s book “Plan B 2.0: Rescuing a Planet Under Stress and a Civilization in Trouble“. Why did they do that, one wonders? It is truly quite amazing to see how the egregiously flawed the whole thing is. Among the citations that should be reconsidered: Paul MacCready’s computations need be replicated and carefully contextualized. The St. Matthew Island’s reindeer population collapse-by-overgrazing story has been seriously questioned by scientists and may be more relevant to indicate the dangers of a cooling climate instead (and the peculiarities of ungulate wild population sizes). The same can be said for Easter Island, where population is unlikely to have reached 15,000 (let alone 20,000 as quoted by Brown), and the decimation was more likely caused by European germs and slave traders than anything else. Finally, Brown advocates a yearly expenditure of $190 billion dollars just for global warming. I am sure you and me and everyone elase could do a lot more good with a lot less than that money. Is the planet under stress? Is civilization in trouble? Do we need a Plan B 2.0 to rescue either or both? Perhaps. Or perhaps not, based on how weak the foundations of Brown’s reasoning are. Who will ever believe that the news articles reported below are meant to be about the same person giving the same speech? The Pope asks the international community to assume its responsibilities and to not postpone its decisions in matter of environmental protection of the atmosphere. That must be done, he reminds, “with precaution”, a collective engagement and “without ideological accelerations towards hastened conclusions”. It must be done – he adds – within a “dialogue” and not with “unilateral decisions”. After a (disastrous) preventative war in Iraq in 2003, we are going to see a (potentially disastrous) preventative Nobel Peace Prize awarded to Al Gore and the IPCC on December 10 at a ceremony in Oslo. Why can’t we deal with real-and-present problems, and have to make up fantasies of new ones, I wonder? What will people make of our climate change circus in 50 years’ time is anybody’s guess. Surely though, they will still question what Al Gore and the IPCC had actually done, by the middle of 2007, to deserve a prize. No Kyoto-II agreement has been reached yet, no CO2 emission cutting program has been implemented by any Government yet, and no “smoking gun” for greenhouse-gas-induced climatic change has been found yet. Things are actually a-moving, and the still-ongoing Bali conference may come out with a document asking developing countries to develop rather less. Who would have thought that “global warming” rhymes with “neocolonialism”? And yet, there is some hope. The bandwagon has become so huge, it will be next-to-impossible to steer. Expect ridiculous targets nobody will ever try to reach, set for times unbelievably far in the future. Until one day, the Sun will cool us down, and so will die the mad dream of anthropogenic climate change. The UN Conference on climate change in a luxury resort in sunny Bali is likely to go down in history as the biggest waste of public money this side of Nero’s rebuilding of Ancient Rome. The idea that the only way to get less CO2 in the atmosphere is to organize the biggest event in UN history is beyond belief. As a long-time subscriber of the IHT I write to complain about your absurd choice of playing down both the death of 3 sailors during the recent storms in the Black Sea, and the fact that 20 more are missing and likely dead themselves due to the cold. In the front page of the IHT’s paper edition of Nov 13, there is a short unsigned article titled “Counting losses in Black Sea storm“. In 59 words there is not a single mention of the human losses, and the reader is left with the impression that the ships’ captains and owners will be sued only for “environmental damage“. Has human life become as cheap as to be free to be taken? True, there is a larger article at page 2, by Andrew E Kramer, where finally we learn of the human tragedy in the title “Black Sea toll: 3 dead and 20 lost“. This appears to be similar to an article on the IHT web site, again by Mr Kramer, although over there it is titled “Environmental disaster unfolding in Russia“. The paper version starts “Three dead sailor and dozen of birds slicked with oil…“. Just a few words later “Another 20 sailors were missing“. Roughly a little less than half of the piece is dedicated to environmental issues (but again, there is no mention of any ongoing prosecution for the loss of human life). The online version starts with “An environmental disaster began to unfold” and only talks about humans in the second paragraph. But then, dead and missing people are literally forgotten about, and roughly more than three quarters of the article is about environmental problems. For the third time, the only mentioned prosecution is about “environmental damage“. Interestingly, in the paper article a Greenpeace Russia campaigner, Vladimir Chuprov, is said to have “called the spill a catastrophe of local rather than international scale“. No such a thing is mentioned online. All in all the above indicates a very poor choice by front-page and online Editors to find an excuse to push the “right buttons” about the environment, for some unfathomable reason deciding to play down the human cost of the Black Sea storm. Shall we worship the Environment to the point of forgetting the people? That is a false dichotomy. We can take care of the environment and take care of humans too. Why didn’t anybody else think this before? Actually, I have a recollection of Soviet tanks being shipped anew to be converted into scrap metal, in order to boost the production reports of both industries. Sir David King, the rather hyperactive UK Government’s Chief Scientist, has decided to forego the results of scientific research and propose a cull of badgers for the sake of stopping the spreading of Bovine Tuberculosis (bTB). What scientific research? Three major aspects, for a start: first of all, the finding that only a complete and extremely expensive eradication of all badgers would work, as they naturally move away from areas where they are getting killed; then, the universally-accepted figure of 40% of cattle bTB cases caused by badgers, that is leaving 60% of them out of the picture; and finally, the fact that there is an ongoing trial for a vaccine that would protect cattle from bTB, so the destruction of wild animals may not be needed at all. We should ask ourselves, what would a cull be for? Let’s imagine a wholesale campaign of destruction of badgers were feasible: what kind of environment would the UK be left with? Do badgers spend their time spreading bTB, or rather do what badgers usually do, namely eat lots of other animals, and some vegetables and fruits? How can the newly-found fashion of Being Green turn into the killing of animals? Sir David has come up with the ridiculous idea that “culling could be effective in areas that are contained, for example, by the sea or motorways“. Hopefully the UK Agriculture and Environment Ministry (Department for Environment, Food and Rural Affairs) will keep doing nothing, especially as 95% of the public has expressed itself against the idea of a cull of badgers. But it is telling that the push to destroy so much animal life comes from the same Sir David that, in the name of Science, has already said that Climate Change is a bigger threat than Terrorism, and helped prepare a report on the basis of which it has been said that (yawn!) Obesity is as much a problem as Climate Change? As said by Professor John Bourne, Sir David’s reason to forgo the results of Science is “consistent with the political need to do something about [bTB]“. That the same person may yell for the whole of humanity to change lifestyle to protect the environment in the future, whilst arguing to slaughter wild animals in the present, is a sad indictment of that politicised “Science” that can demonstrate everything and its opposite. ps: bTB is a problem for farmers. What should they do? It is true that “cows are also entitled to lives“, as a farmer told the BBC, but…are we sure that such an entitlement must signify the systematic destruction of another species? For farmers then, how about helping finding ways to improve testing for bTB, keep the badgers out, to vaccinate the herds, to manage/cure the disease? There’s lots of things that could be solved by extermination, but who’s going to kill all cats and dogs to cut down the number of cases of zoonoses, the diseases that can spread from animals to people? Editorial control must have relaxed at The Economist, of late, or else for a series of unfortunate circumstances nobody at HQ is reading the magazine end-to-end any longer. “Nuclear power-Atomic renaissance“, Sep 6th, where we are told that “the current expansion of nuclear power”, based on lowering emissions of greenhouse gases, “is unlikely to be slowed down by concerns about what to do with the waste”. “Jolly green heretic“, Sep 6th, where credit is given to a Stewart Brand who, having been wrong about “his alarmism over the Y2K computer bug”, and having thereby convinced himself that the world is “modular, shockproof and robust”, for unfathomable (and unfathomed) reasons considers global warming the “single most important environmental threat facing mankind”. “Gambling on Tomorrow” and “Tomorrow and Tomorrow“, Aug 18th, where we are told that all current climate models are too simple, and were not really checked against reality. This from the same magazine that has recently changed its mind, and thinks global warming is “for real”. Having seen what excesses the Senator could reach in his campaign to uncover Communists, public opinion turned against him. Are we witnessing something similar about Climate Change? Have the catastrophists finally overreached, to the point of toppling themselves over? 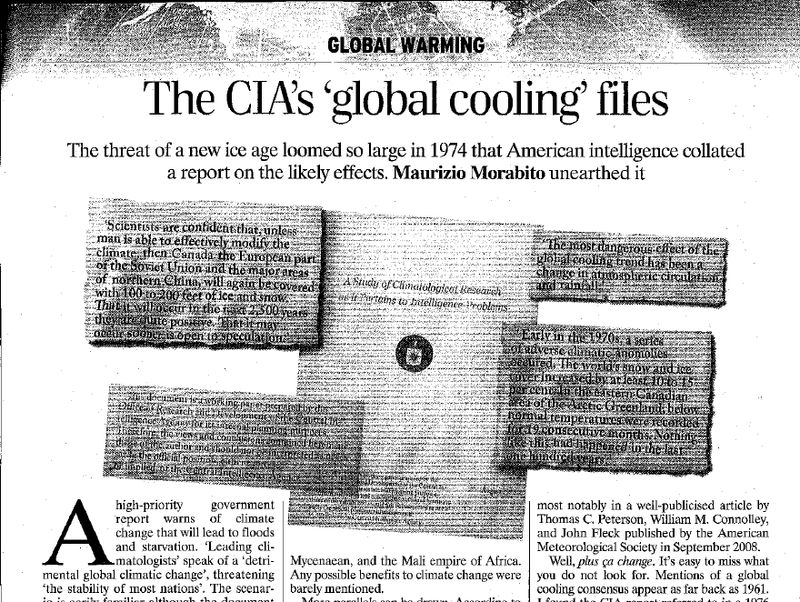 The indications are all there: because after Newsweek’s 9-page-tirade against anybody that dares to doubt anything about anthropogenic climate change (Aug 13, 2007), the tide is starting to turn. In fact, no less commentators than Jeff Jacoby on the Boston Globe, and Robert J Samuelson in the next issue of the very same Newsweek magazine, have recently denounced the absurd attitudes of people apparently allergic to any form of dissent in matters of climate change. For years, in the best of circumstances one has been labeled a “skeptic” (as if there were anything wrong with that!) at the first hint of not following the exact line behind the likes of Al Gore, James Hansen and the IPCC. Some of us had to repeatedly answer charges of “denialism”, a slur meant to create the impression of equivalence between those skeptical of a _possible_ FUTURE catastrophic change in the climate caused by human activities’ carbon dioxide emissions, and those still doubting the historical, PAST _fact_ of the Holocaust. Note that I haven’t even mentioned the veiled and not-so-veiled threats of future trials ‘a-la-Nuremberg. Between that and a complete picture of Climate Change Supremacism, only violence appeared to be missing in the actions of those carrying out a hard-headed campaign bent on stifling any hint of opposition to upcoming grand, poorly-thought-out lifestyle-changing plans such as carbon-emission-rationing. Who knows, perhaps crosses will start burning on somebody’s lawn as soon as a zero-carbon-emission flame becomes readily available? But then, psychological violence has already started creeping in. How else to characterize President of the American Council on Renewable Energy, Michael Eckhart’s threat of career destruction against Marlo Lewis of the Competitive Enterprise Institute? That must surely be the most egregious example of the poisonous atmosphere concocted up by climate totalitarians. But it is just the latest and the biggest in a series. Martin Durkin, author of the Great Global Warming Swindle documentary found himself under an unduly heavy barrage of condemnations of various sorts, including highly-browed calls for censorship by esteemed Professors. Steve McIntyre, the blogger/statistician that has recently discovered a bug in the software used by NASA to incorrectly attribute the warmest of US years to 1998, has seen his website crushed by an apparent DOS attack just hours later. My own views (a basic question: if the climate is changing, where is the change in weather, not just temperature?) have been abused at times to “demonstrate” I wasn’t worthy of engaging in a discussion in a completely different area. We literally live in the middle of an escalation of tones. Even people genuinely worried about Global Warming must understand how dangerous and ultimately self-defeating the attitudes of climate totalitarians and climate supremacists are. If there really is an upcoming disaster, shouldn’t efforts concentrate on getting the world prepared, rather tan on stamping out differences of opinion? Jacoby is right when he specifies that good intentions are not an excuse. All revolutions are avowedly meant for the betterment of Humanity. But whilst the American one led to the Constitution, the French Revolution brought years of guillotined Terror. There is no need to remind the horrors perpetrated by Italian Fascists, German Nazis and Russian Communists, believe it or not all in the name of great ideals of peace and prosperity. We are the children and grandchildren of the millions that either fought to contain and defeat dictatorships, or were misguidedly seduced into selling out their freedoms to monomaniacal, homicidal types with illusions of omnipotence. History will not and cannot forgive us, if we let that happen again. There is absolutely no need to shove in “climate change”: look no further than the Sahel area in Niger, where rains have come back after the local government has finally decided to take care of its trees. The downside of the absurdity of the UN intervention, its stupidity, is that time and money will be spent to tackle a non-problem, whilst the real culprits will get an easier ride simply by pointing out “climate change” is somebody else’s fault. And so, as the actual issues are not taken care of, we can only expect failure about Darfur. 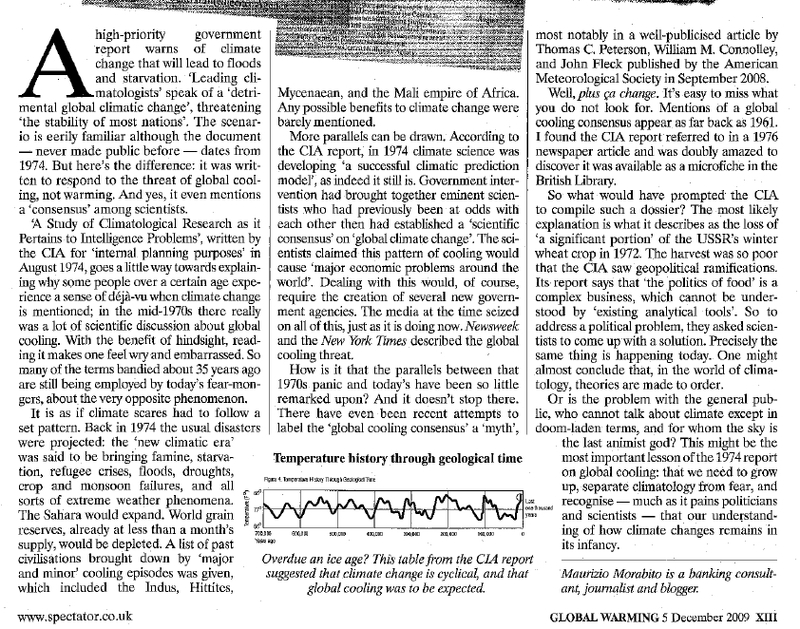 If the effect of clouds on climate is “obscure” and “little is currently known about where [aerosols] end up in the atmosphere” (as recognised on The Economist’s “Grey-sky thinking”, July 5, 2007), what kind of hubris is necessary to state, as at the beginning of the article, that “the general trends [of climate] are clear”? Late-XIX-century physics looked pretty much complete too, apart from the obscure problem of black-body radiation, solved by Planck in 1900 by discovering the hitherto completely unknown world of quantum physics. Who could remember, 50 years ago they had the same concerns for the environment and fellow human beings as we do. How comforting…perhaps after a future war, when scavenging for survival through flattened cities there will be little danger, at least of the radioactive variety. G-8 leaders are preparing to go through the motions about “doing something against Climate Change” (presumably, with similar successes as their wars on poverty and drugs). Countless pacts, accords, international conferences have not meant much as yet, and in all likelihood they won’t make any perceivable difference in the future either. In a further sign that something is amiss, there is not even the suggestion of designing a satellite capable of collecting global data and possibly evidence of global warming / climate change. GoreSat itself is not mentioned anywhere, despite sitting ready to fly for the past 7 years. The above clearly indicates that “Climate Change” as a real issue has died already, or is at a terminal stage. At best, it has revealed itself as a proxy for something different, at worst a smokescreen, ancillary issue. Let’s give everybody involved the benefit of the doubt. What is the real problem they are concerned about, then, if “Climate Change” is just a proxy? Possible candidates include: (1) the will to counteract the power of global companies by establishing some kind of (toothed) global government; (2) a general feeling tha Humanity must be cleansed of its sins, especially of greed and of disrespect for the Environment; (3) a way of keeping the development of places such as China and India in check, by making their lives difficult with newly-fangled emission caps. But the one trouble I am presently more inclined to consider, it’s (4) the worry that there simply are too many humans alive at the same time, and their numbers keep on increasing: at the same time, we have the attitude but not the tools nor the will to provide them all with a decent life. That’s a much more interesting topic than silly measures of atmospheric carbon dioxide and unreliable, patched-up, secretive historical temperature recordings.